In this post is a fresh list of stocks which have experienced massive buying. I believe the stocks listed in this post are worthy of adding to the stock watch list. As stated at the bottom of this post, I have chosen three stocks which I may be speculating with in the weeks to come. As stated in previous blog posts I'm a firm believer of stocks which have had significant moves higher on big volume. Some of these stocks will sell off, and some will continue to move higher, it is important to use caution when purchasing and use discipline when selling. All of these stocks have had nice moves higher on huge volume (% volume increase compare to 50 day average). For the week of July 27, 2009, the stocks which are on my watch list are listed in the table below. As you may know some of these stocks could give back all of their gains just as quickly, so instead of purchasing the stock, sometimes I purchase at or near the money call options on the stock. Purchasing call options is a cheaper way of opening a position on a stock, but if the stock sells off, you'll lose 100% of the premium you paid for the option and will not hold the stock, however if the stock continues to rally, you're % gain will most likely be much greater than if you purchased shares on the stock. To learn more about opening an option position like this click here. Not all of these stocks have options traded on them, but the ones which do could pay off in big ways. I used this strategy when purchasing STEC Inc (STEC), and it paid off as STEC continued to rally after the calls were purchase (see more here). 3 stocks which have really caught my eye from the list above, and have options available on them are: LaserCard Corporation (LCRD), Alexion Pharmaceuticals, Inc. (ALXN), and SonicWALL, Inc. (SNWL). I'll be looking at purchasing call options for the August option expiration starting Monday. LCRD Option Trade: Purchase the in the money August 5 call options. To open this contract as of close Friday July 24, 2009 would cost roughly $35 per contract. Buying on weakness is key; If LCRD pulls back, I may buy some of these contracts. These options expire August 22, so if I could open a position on weakness, and then LCRD rallies, I would most likely look at writing out my August 5 call options for the August 7.50 call options (known as a vertical call spread- learn more here). I would do this because it would lower the cost of my position (at the same time limiting my upside), but I have completed spreads where I could not lose (waiting for a rally in the stock and selling the higher strike call for more premium than I paid for the lower strike call). ALXN Option Trade: Similarly to the example above I would look at creating a spread, but I would use the calendar spread option strategy. I would buy deep in the money call options for the January 2011 20 strike call option. As of close Friday this would cost roughly $2,400 per option contract. I would then write this stock out monthly until I was called out. I would write the August 2009 45 strike call option out for $90 per contract. This would give me downside protection on my initial investment of 3.75% and would yield a return of 7.92% in less than 4 weeks. The current options market is factoring in a 35.3% chance of having this stock called out at expiration. In that case I would simply write a similar strike hoping for another nice premium for the September options expiration. SNWL Option Trade: I would look at all out speculation with this company, as the share price and volume both exploded. I would look at getting into the September 2009 7.50 strike call options on this stock. This would cost me roughly $50 per contract as of Friday's close, but I would look to get in on weakness. To break even the stock would need to get to $8 a share, and getting the stock over that isn't out of the question, especially if this rally continues. The current options market is factoring in a 21% chance this stock is at or above $10 a share by the September options expiration. In this post I will be writing about an option strategy known as the Diagonal Call Spread Option Strategy. To understand this post you'll need somewhat of a background in stock options. To learn more about options and, how options can help protect your portfolio, and allow you to speculate with less money up front; check out my book here. A Diagonal Spread option strategy is very similar to the Bull Call Spread option strategy, except that it uses different option expiration dates instead of the same. This strategy is a great way to generate monthly income off the ETF, regardless of what the fund does. I will be using three very popular ETF's for my examples, but similar strategies can be used on any stock that offers stock options. The ETF's are the: Diamonds Trust (DOW), Series 1 (DIA), PowerShares QQQ Trust (NASDAQ), Series 1 (QQQQ), and SPDR S&P 500 (SPY). All data as of market close Friday July 24, 2009. Income Generating Strategy #1: Purchase the in the money DIA 50 strike January leap 2011 call option, and sell the 93 strike August 2009 call option against it. The initial cost of the January leap 50 call option is $41.07 per share. Writing the August option out would give you cash of $1.03 per share or 2.5% of your initial investment. If the ETF is assigned at the August options expiration, the total return is 7.21% (in less than 30 days). If the position is not assigned (called out) you will have profited 100% of the premium received ($1.03 per share or 2.5%), and will be able to write the option out again for a future expiration generating additional income. You will be able to write options out on this ETF on a monthly basis until January 2011 (546 days). Income Generating Strategy #2: Purchase the in the money QQQQ 20 strike January leap 2011 call option, and sell the 41 strike August 2009 call option against it. The initial cost of the January leap 20 call option is $19.51 per share. The August 41 Call option is currently trading for $0.35 per share. Writing this option out would give you cash of $0.35 per share or 1.8% of your initial investment. If the ETF is assigned at the August options expiration the total return is 9.43% (in less than 30 days). If the position is not assigned (called out) you will have profited 100% of the premium received ($0.35 per share or 1.8%), and will be able to write the option out again for a future expiration generating additional income. You will be able to write options out on this ETF on a monthly basis until January 2011 (546 days). Income Generating Strategy #3: Purchase the in the money SPY 50 strike December leap 2011 call option, and sell the 100 strike August 2009 call option against it. The initial cost of the December leap 50 call option is 48.58 per share. The August 100 Call option is currently trading at $1.49 per share. Writing this option out would give you cash of $1.49 per share or 3.1% of your initial investment. If the ETF is assigned at the August options expiration the total return is 7.06% (in less than 30 days). If the position is not assigned (called out) you will have profited 100% of the premium received ($1.49 per share or 3.1%), and will be able to write the option out again for a future expiration generating additional income. You will be able to write options out on this ETF on a monthly basis until December 2011 (876 days). When I open diagonal option call spread positions, I like to purchase contracts which have the longest time until expiration, and like to write the contracts with the closest time until expiration against it (given roughly a 5% return or greater if assigned). If the stock is not assigned at expiration, I simply write it out for a similar strike price for the following month. It is like receiving monthly dividends. I've been using this strategy to sell near the money calls on my leap stock options for the short term, and find it to be a great source of generating income for my portfolio. Using these ETF's versus stocks, is a much safer strategy, but won't return as much either. If I want to be long a stock I simply purchase deeper in the money leap options, and write call options for the near term expiration against them. It is a great way to be in the stock, receive income (premiums) month after month (that's if it's not assigned), while returning a profit on the position if the stock happens to be assigned. The downside however is you limit your upside gain for the stock. In the past 5 years, the volume of option contracts traded has exploded according to the Chicago Board Options Exchange [CBOE]. The reason being is that more and more investor's are finding options to be a good source of income, a great way to hedge their portfolios, and a way to speculate with less cash up front. To see a chart showing options volume over the last 5 years, and to learn more about options in general click here. Today's top ten most active stock options are listed below from the most amount of contracts traded to the least. I am surprised the market is holding up as good as it has been so far today... I went short into close yesterday, and haven't been able to cover today anything for a nice profit. As of now the top ten option contracts traded, from the most contracts traded to least are listed below. On the back of some upsetting earnings numbers coming from Amazon (AMZN), American Express (AXP), and Microsoft (MSFT), it looks as if the market may have a tough day keeping this rally going (12 days on the NASDAQ). With the Volatility Index (VIX) being at the lowest levels in a long time, and earnings from: Amazon (NASDAQ:AMZN), American Express (NYSE:AXP), and Microsoft (NASDAQ:MSFT) sparking an after hours sell off, it would be a great time to purchase leap 2011 call options (that is if you believe in this rally). Calls are cheaper with less volatility, and of course if the price of the stock goes down so does the premium paid for the call. In this article I will write about 10 major financial stocks and a calendar spread option strategy on each one. To understand this article you need somewhat of a background in stock options. o learn more about options and, how options can help protect your portfolio, and allow you to speculate with less money up front click here. Calendar spreads are similar to bull call spreads, except the date for the expiration is different. All data as of market close Thursday July 23, 2009. Pricing will change throughout the trading day. Calendar Spread Option Strategy #1: Purchase the in the money American Express (AXP) 10 strike January leap 2011 call option, and sell the 30 strike September 2009 call option against it. The cost of this strategy is $1,770 per option contract, and if the stock is assigned at September expiration the profit from this position is $230 per contract or 12.99% (57 calendar days). This position will be profitable (not taking into account commissions) as long as American Express is at or above $27.70 a share by September 19, 2009 (September options expiration). The current options market is factoring in a 49.0% probability American Express will be at or above 30 a share at September options expiration. Calendar Spread Option Strategy #2: Purchase the in the money Bank of America (BAC) 5 strike January leap 2011 call option, and sell the 13 strike September 2009 call option against it. The cost of this strategy is $727 per option contract, and if the stock is assigned at September expiration the profit from this position is $73 per contract or 10.04%. This position will be profitable as long as Bank of America is at or above $12.27 a share by September 19, 2009. The current options market is factoring in a 49.3% probability Bank of America will be at or above 13 a share at September options expiration. Calendar Spread Option Strategy #3: Purchase the in the money Bank of New York Mellon (BK) 10 strike January leap 2011 call option, and sell the 27.50 strike September 2009 call option against it. The cost of this strategy is $1,600 per option contract, and if the stock is assigned at September expiration the profit from this position is $150 per contract or 9.38%. This position will be profitable as long as Bank of NY Mellon is at or above $26.00 a share by September 19, 2009. The current options market is factoring in a 47.6% probability Bank of NY Mellon will be at or above 27.50 a share at September options expiration. Calendar Spread Option Strategy #4: Purchase the in the money Goldman Sachs (GS) 100 strike January leap 2011 call option, and sell the 180 strike September 2009 call option against it. The cost of this strategy is $6,843 per option contract, and if the stock is assigned at September expiration the profit from this position is $1157 per contract or 16.91%. This position will be profitable as long as Goldman Sachs is at or above $168.43 a share by September 19, 2009. The current options market is factoring in a 26.1% probability Goldman Sachs will be at or above 180 a share at September options expiration. Calendar Spread Option Strategy #5: Purchase the in the money JP Morgan (JPM) 10 strike January leap 2011 call option, and sell the 38 strike September 2009 call option against it. The cost of this strategy is $2,566 per option contract, and if the stock is assigned at September expiration the profit from this position is $234 per contract or 9.12%. This position will be profitable as long as JP Morgan is at or above $35.66 a share by September 19, 2009. The current options market is factoring in a 54.1% probability JP Morgan will be at or above 38 a share at September options expiration. Calendar Spread Option Strategy #6: Purchase the in the money KeyCorp (KEY) 2.50 strike January leap 2011 call option, and sell the 5 strike December 2009 call option against it. The cost of this strategy is $215 per option contract, and if the stock is assigned at December expiration the profit from this position is $35 per contract or 16.28%. This position will be profitable as long as KeyCorp is at or above $4.65 a share by December 19, 2009. The current options market is factoring in a 65.3% probability KeyCorp will be at or above 5 a share at December options expiration. Calendar Spread Option Strategy #7: Purchase the in the money Morgan Stanley (MS) 12.50 strike January leap 2011 call option, and sell the 28 strike September 2009 call option against it. The cost of this strategy is $1,440 per option contract, and if the stock is assigned at September expiration the profit from this position is $110 per contract or 7.64%. This position will be profitable as long as Morgan Stanley is at or above $26.90 a share by September 19, 2009. The current options market is factoring in a 57.6% probability Morgan Stanley will be at or above 28 a share at September options expiration. Calendar Spread Option Strategy #8: Purchase the in the money PNC Financial (PNC) 10 strike January leap 2011 call option, and sell the 35 strike November 2009 call option against it. The cost of this strategy is $2,170 per option contract, and if the stock is assigned at November expiration the profit from this position is $330 per contract or 15.21%. This position will be profitable as long as PNC is at or above $31.70 a share by November 21, 2009. The current options market is factoring in a 58.6% probability PNC will be at or above 35 a share at November options expiration. 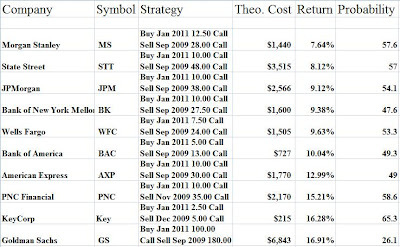 Calendar Spread Option Strategy #9: Purchase the in the money State Street (STT) 10 strike January leap 2011 call option, and sell the 48 strike September 2009 call option against it. The cost of this strategy is $3,515 per option contract, and if the stock is assigned at September expiration the profit from this position is $285 per contract or 8.11%. This position will be profitable as long as State Street is at or above $45.15 a share by September 19, 2009. The current options market is factoring in a 57% probability State Street will be at or above 48 a share at September options expiration. Calendar Spread Option Strategy #10: Purchase the in the money Wells Fargo (WFC) 7.50 strike January leap 2011 call option, and sell the 24 strike September 2009 call option against it. The cost of this strategy is $1,505 per option contract, and if the stock is assigned at September expiration the profit from this position is $145 per contract or 9.63%. This position will be profitable as long as Wells Fargo is at or above $22.55 a share by September 19, 2009. The current options market is factoring in a 53.3% probability Wells Fargo will be at or above 24 a share at September options expiration. When I open option calendar spread positions, I like to purchase contracts which have the longest time until expiration, and like to write the contracts with the closest time until expiration against it (given roughly a 5% return if assigned or greater). If the stock is not assigned at expiration, I simply write it out for a similar strike price for the following month. I've been using this strategy to sell near the money calls on my leap options for the short term, and find it to be a great source of generating income for my portfolio. If I want to be long a stock I simply purchase in the money leap options, and write call options for the near term expiration against them. It is a great way to be in the stock, receive income (premiums) month after month (that's if I don't get called out), while returning a profit on the position if the stock happens to be assigned. The downside however is you limit your upside gain for the stock. In the past 5 years, the volume of option contracts traded has exploded according to the Chicago Board Options Exchange (CBOE). The reason being is that more and more investor's are finding options to be a good source of income, a great way to hedge their portfolios, and a way to speculate with less cash up front. To see a chart showing options volume over the last 5 years, and to learn more about options in general click here. Below is a printable spreadsheet of the stocks in this analysis ranked in order from least to greatest return (click to enlarge and print). The top ten most active stock options for Thursday July 23, 2009 are listed below from most contracts traded to least. Notice the significant put options being purchased, looks as if the money is betting on a short term downtrend. Currently the market is having a huge day - the S&P 500 is up 2.6% as of 3 PM! However there is a rare occurrence taking place... The Volatility Index (VIX) is also up, when you may have expected it to have been down big. Historically the S&P and the VIX have a negative relationship as shown in the chart below. I blogged about a similar occurrence which happened one June 1, 2009. The market set a new high on June 1, 2009 with the VIX also trading higher for the day. The market sold off the following week, until it retested the high which it could not break. The market was then in a downtrend until recently. The charts look very similar, so I would not be surprised if the market is due for a short term correction. This is a paper I wrote in November, 2008 for an environmental economics class. A research paper on the Chicago Climate Exchange (CCX). Cap and Trade is a topic many Americans are interested in as the Obama Administration is pushing for it. The basics of what a carbon contract is, how it works, and where it is traded. My original research paper is embedded below. Read, print, or download my paper from the Scribd box below. With a massive rally taking place in the stock market across the board today, I will be paying extra close attention to where the money is moving in the options market. As of now, the top ten most traded option contracts are listed in order from greatest to least below. In this post I will be writing about an option strategy known as the Calendar Call Spread Option Strategy. To understand this post you'll need somewhat of a background in stock options. To learn more about options and, how options can help protect your portfolio, and allow you to speculate with less money up front click here. A Calendar Spread option strategy is very similar to the Bull Call Spread option strategy, except that it uses different option expiration dates instead of the same. I will be using three very popular ETF's for my analysis. The ETF's are the: Diamonds Trust, Series 1 (DIA), PowerShares QQQ Trust, Series 1 (QQQQ), and SPDR S&P 500 (SPY). Calendar Spread Option Strategy #1: Purchase the in the money DIA 50 strike January leap 2011 call option, and sell the in the money 90 strike August 2009 call option against it. The cost of this strategy is $3795 per option contract, and if the stock is assigned at August expiration the profit from this position is $205 per contract or 5.4% (30 calendar days). The position will be profitable (not taking into account commissions) as long as the DIA is at or above $87.95 a share by August 22, 2009 (August options expiration). The current options market is factoring in a 68.0% probability this position will be profitable at August options expiration (above the 88 strike for DIA). Calendar Spread Option Strategy #2: Purchase the in the money QQQQ 20 strike January leap 2011 call option, and sell the in the money 39 strike September 2009 call option against it. The cost of this strategy is $1760 per option contract, and if the stock is assigned at the September expiration the profit from this position is $140 per contract or 7.95% (58 calendar days). The position will be profitable as long as the QQQQ is at or above $37.65 a share by September 19, 2009. The current options market is factoring in a 64.6% probability this position will be profitable at September options expiration (above the 38 strike for QQQQ). Calendar Spread Option Strategy #3: Purchase the in the money SPY 50 strike December 31 2010 call option, and sell the in the money 97 strike August 2009 call option against it. The cost of this strategy is $4485 per option contract, and if the stock is assigned at the August expiration the profit from this position is $215 per contract or 4.79% (30 calendar days). The position will be profitable as long as the SPY is at or above $94.85 a share by August 22, 2009. The current options market is factoring in a 65.5% probability this position will be profitable at August options expiration (above the 95 strike for SPY). When I open option calendar spread positions, I like to purchase contracts which have the longest time until expiration, and like to write the contracts with the closest time until expiration against it (given roughly a 5% return or greater if assigned). If the stock is not assigned at expiration, I simply write it out for a similar strike price for the following month. I've been using this strategy to sell near the money calls on my leap stock options for the short term, and find it to be a great source of generating income for my portfolio. Using these ETF's versus stocks, is a much safer strategy, but won't return as much either. If I want to be long a stock I simply purchase in the money leap options, and write call options for the near term expiration against them. It is a great way to be in the stock, receive income (premiums) month after month (that's if it's not assigned), while returning a profit on the position if the stock happens to be assigned. The downside however is you limit your upside gain for the stock. Buffett's Berkshire Decreases Stake in Moody's: Smart Investing or Payback? Warren Buffett's Berkshire Hathaway Inc. (NYSE:BRK.A) reduced its stake in Moody's Corporation by 17% conducting the sale of almost 8 million shares over the open market in the past week. 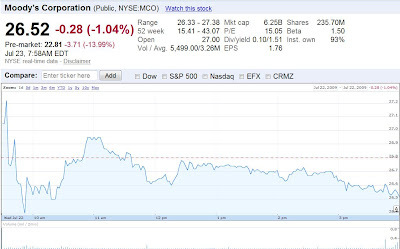 This comes after Moody's (NYSE:MCO) has posted 7 quarterly declines in a row. Is this smart investing, or could it be bitter payback, as Moody's downgraded Berkshire Hathaway's credit back in March 2009? Moody's fell on the news, and certainly looks to have had a very negative impact on it as it is down by almost 14% as of now. There are some more big names reporting earnings today. The stocks I am most interested in are Ford Motor (NYSE:F), Amazon (NASDAQ:AMZN), and American Express (NYSE:AXP). I am curious how the American automaker will report earnings for the quarter where it's biggest U.S. competitor (General Motors, old ticker NYSE:GM) filed for chapter 11 bankruptcy. I have a feeling Amazon will have another great quarter due to strong sales of the Kindle Electronic Book Reader. I am not too concerned about whether American Express trumps earnings or not, but I'm more anxiously awaiting the outlook on business spending the management team over at American Express is going to give - this is a great economic indicator. The stocks I'll be keeping a close eye on are listed below. As of now the U.S. stock market futures seem to be green across the board. Its an early indicator that the bulls will chalk yet another win, but a lot can change with another big earnings day ahead. 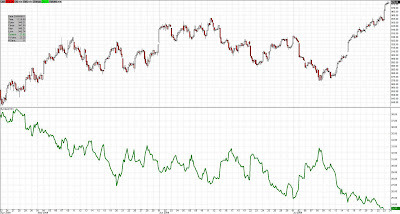 The calendar spread option strategy is a strategy I don't usually write about on OptionMaestro.com, the reason being is because they're hard to grasp at first for most people. However I want to inform you, that once understood, they come second nature. Therefore to understand this post you'll need an understanding of stock options. To learn more about options, how options can help protect your portfolio, and allow you to speculate with less money up front click here or check out my E-Books. The Calendar Spread Option Strategy is very similar to the Bull Call Spread (a.k.a option spread), but both strike expiration dates are not the same. In this post, I have a table of 20 popular stocks which indicates: which options expiration dates are used for the strategy, the price of opening the position, and the % return (if stock is assigned). All data as of market close July 22, 2009. Strategy - This is the strategy used to open the calendar spread option strategy. The option contract which expires at a later date is purchased first (in my examples all happen to be for the January 2011 leap option expiration), and then the option contract which expires at an earlier date is sold against it. Theo. Price - This is the theoretical price as of market close July 22, 2009. This is the premium paid for the option contract purchased less the premium received for the option contract sold. Return - This is the return assuming the stock is at or above the indicated strike price from the option contract being sold at that expiration date. Currently all but one of these strategies are in the money (Procter & Gamble not above 55 a share as of market close). Purchase the in the money Abbott Labs (ABT) 30 strike January leap 2011 call option, and sell the in the money 44 strike September 2009 call option against it. The cost of this strategy is $1230 per option contract, and if the stock is assigned at September expiration the profit from this position is $170 per contract or 13.82% (58 calendar days). The position will be profitable (not taking into account commissions) as long as Abbott Labs is at or above $42.31 a share by September 19, 2009 (September options expiration). Although Citigroup and Bank of America made up 6 of the top ten option contracts traded today, for the first time in 4 days C and BAC didn't dominate the top ten options contracts with all but 2 or less in the top ten. Today's top 10 option contracts traded are listed in order below. Apple Inc. (NASDAQ:AAPL) is currently up 5.99 points to 157.50. I'm trading out of half of my Apple August 155 call options for a 30+% gain since yesterday afternoon. I will try purchasing them back on weakness, as that was an impressive quarter and I think they're headed higher. If we do experience weakness, I'll be trading out of my Apple 150 Put options as well (I purchased those yesterday also). The trade I used yesterday was the strangle option strategy. I strangled Apple while it was near 153 a share for the 150 Put/155 Call options. To see more about using this type of option strategy on Apple click here. Even with volatility down on Apple stock, because earnings are over with, there is still a month to trade these option contracts, I'm certain the road ahead will be volatile enough. It is Wednesday July 22, 2009 and another big earnings day is among us. There are 150 expected earnings releases for today. 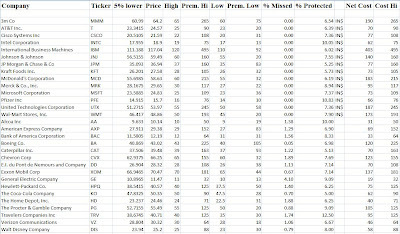 The stocks below are some of the names I'll be keeping a close eye on and listening in on conference calls for. As we enter another big earnings day for the U.S. financial markets, the current stock market futures are mixed. Still a long day ahead, but two of the three major indices point lower. The only major U.S. index that is up is the NASDAQ, and that is most likely because Apple Inc. (NASDAQ: AAPL) blew away Q3 estimates and traded as high as 159 a share in after hours trade. Will earnings continue to surprise on Wall Street, or will Apple have to pull the rest of the market with it to keep the bulls pleased another day? In the past week earnings have propelled the stock market to rally significantly. Since Tuesday July 14, 2009 the Dow Jones Industrial Average leads all major indices up 6.66%, NASDAQ is higher by 6.47%, and the S&P 500 has gained 5.38%. The question a lot of people have been asking is: Can this rally hold? To tell you the truth, I'm not sure what to think of it, but I have some hedges in place, for the next piece of ugly news that the market sells off on. With that being said, as I've stated 100 times in my blog OptionMaestro.com, there's still a ton of cash on the sidelines, getting extremely low rates. This rally could continue for quite a while as this money could be moved into the market. This is part one of two, in this article I'll take the bearish approach on the market, and give a Bear Put Spread option idea on each component of the Dow 30. In part two I'll take a bullish approach on the market with a Bull Call Option Spread idea on each. To understand this post you'll need somewhat of a background in stock options. To learn more about options including this strategy, how options can help protect your portfolio, and allow you to speculate with less money up front click here. Why use the Bear Put Spread Option Strategy instead of plain old put options? The reason I like selling the spread when hedging my portfolio is because it allows me to hedge for a cheaper premium, and although it gives me less downside protection, I believe it should protect the majority of the move lower if the market does correct in the month to come. All data as of market close Tuesday July 21, 2009. High - This is the higher strike price of the two Put option contracts, the one being purchased in my examples. To keep things simple I chose the option strike price closest to the closing price. Some strikes may be below current share price and some may be above. Low - This is the lower strike price of the two put option contracts, the one being sold in my examples. I took the strike at least 5% lower from the current share price. % Missed - This is how much the given stock will fall by before the higher of the two put options starts protecting your position. Stocks currently below the higher strike price do not have any % miss, as they are in the money. % Protect - This is how much protection the option spread protects your position. The difference between the high strike and the low strike, or current share price to low strike (for in the money examples). Buy the 3M (MMM) August 65 put and sell the August 60 put. This position gives you protection of up to 6.54% [$4.20 per share] on 3M (hedges position down to 60 a share until August 22, 2009). This position is currently in the money by 80 cents ($0.80) a share which means % missed does not apply. This spread strategy would cost $190 per contract to open, versus $265 for each August 65 strike put option contract purchased. These options expire on August 22, 2009; therefore the last trading day is Friday August 21, 2009. These are just examples and are not recommendations to buy or sell any security; if you're more bullish/bearish, you’ll want to adjust the strike price and expiration accordingly. To learn more about the option spread strategy and other option strategies check out my option trading books. If you're more bullish / bearish you’ll want to adjust the strike price accordingly. If you’re even more bearish, sell a put much lower than the one purchased, or don't sell a put at all. The cost will be more expensive to open the contract, however the downside protection will be greater. This strategy is a great way to hedge your portfolio. One reason option volumes have exploded over the past 5 years is because they are a great way to hedge your portfolio (see chart here). Below is a picture of the spreadsheet I used to calculate these values (click on the image to enlarge).